Regardless of how traditional (Neanderthal...:-) your woodworking interests, at some point in your career you're going to face the problem of applying a wood edge over a composite core. Uncle Harry will ask about some budget cabinets or Aunt Martha will want a cheap coffee table. Face it - the time will come. When that day arrives you'll confront many decisions: what type of panel to use (plywood, MDF, Melamine, etc), whether to buy or make the edgings or what's the best glue to use. Typically we don't consider alternative methods for flushing panel edges because routers sporting flush-trimming bits are the 'tools-du-jour'. If you're already familiar with flush-trimming bits, you've probably experienced differing meanings to what is termed 'flush'. In many cases the bit does it's job admirably; it's bearing follows the panel surface exactly while we balance the router precariously on the wooden edge with the careful skill of a surgeon. A couple swipes with the sandpaper and we're done. Yeah...right. In many cases the bit isn't exactly flush; where the cutter grinder and the bearing manufacturer aren't necessarily on the same page. Sometimes the bit is more than flush; taking a bit of the panel with it. And what about those nasty bearing marks - more dents to sand out of softer wood panels and killers to a clean melamine job. Each time you send your bit out for sharpening you can add extra minutes for sanding. Just flush that flushness down the toilet. 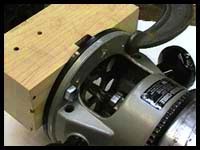 Instead of a bearing to register the depth of cut, this jig uses a block of wood for a fence, clamped and lagged to the base of the router. The overhanging edgebanding moves into a rabbet recess in the block where it's trimmed flush by the router bit. Overview - This jig isn't anything new. I've used similar setups for a router table and a friend applies this technique for flushing laminate when covering cabinets with Formica. 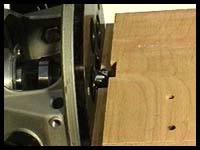 In his case, a small block mounted to a laminate trimmer base rides smoothly over screws where a router bearing would gouge the cabinet's corner. This is something to think about when flushing edges applied to panels with thru rabbets and dados - the wooden fence just rides over the dado unlike a bearing which falls into the recess, gouging the edge. 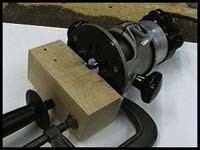 There are two advantages for the hand-held method over adapting something similar for a router table. The short router base and fence will follow any irregularities in the panel like crook or bow better than a wide router table. 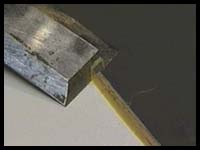 With some test cuts performed on scrap, you can get nearly EXACT depth of cut in two directions. The second advantage depends largely on the size of panels you want to trim. With large pieces like full-height bookcase sides or large MDF doors, the hand-held unit will be easier to use. This doesn't mean you shouldn't use a router table to apply this technique. By all means, if you work with smaller pieces, a router table makes the most sense. A good rule of thumb in situations where you need to decide between stationary and portable machinery is consider which will be easier to move - the workpiece or the tool. The fence needs to be square and solid. A lag bolt through the base anchors one end of the block and gives it a pivot point for adjusting the distance between the bit and the edge-banding. The heavy C-clamp holds the other end securely, allows infinite adjustability for depth and it's mass helps to offset the cantilevered weight of the router. The underside of the maple block shows a rabbet about 3/8" on a side. I haven't used this technique for anything but thin edgings but I don't see why it couldn't be used for edges up to 3/4" or more. Adjust your rabbets accordingly and experiment on some scrap if climb-cutting is desired. Maybe a wider fence is needed? For really wide edgings I prefer another technique but we'll save that one for a future article - can't give away all our secrets at once! The bits of choice, naturally, are spiral. These bits approach the wood at an angle and sheer the wood sideways, reducing tearout and producing an extremely smooth surface. The bit at left is a plunge-cutting mortising bit. 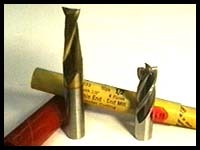 The one on the right is a four-flute end-mill cutter typically used in machinist's milling machines. I haven't tried the carbide versions of these bits yet and I probably won't considering how well the HSS cutters work. I'll just have to see how long they stay sharp. 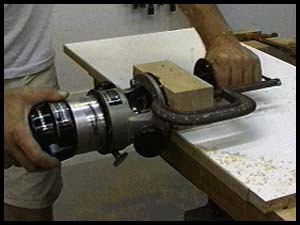 In use, it's best to let your glue joints stabilize completely before attempting such exacting flush-trimming. 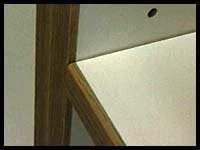 Titebond and other PVA glues contain water which swells panel edges and wood edgings. Flushing them out too soon might return mixed results if all the water hasn't evaporated yet. For my particular project, using melamine panels, I set the fence to cut a little lower than flush to allow for the thickness of the polyurethane finish to be applied to the oak edging. To keep from nicking the melamine coating, the bottom of the bit stops at the edge of the panel, leaving the glue untouched. Yes, it's that accurate! The dried glue snaps off with one swipe of a chisel. If you build a similar jig, especially if it's fancier than this one, (gyroscopic stabilizers optional :) I'd love to hear about it. If you have any questions or comments about this article please feel free to write.